Mai Mang. 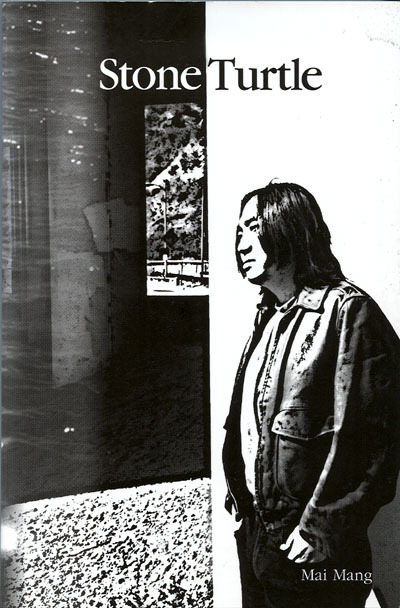 Stone Turtle: Poems, 197-2000. Mai Mang’s bilingual collection, translated by the author himself, is an important contribution to the still small corpus of contemporary Chinese poetry accessible to readers of English. It is also a useful introduction to a poet of some stature, one who emerged shortly after the Obscure Poetry movement (or Misty Poetry movement) had opened the floodgates to unmitigated personal expression in the late 1970s. The New Generation Poetry, as a variety of stylistic encampments are generically referred, largely set the stage for China’s contemporary poetry scene. 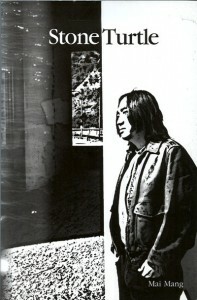 While the polemical self-positioning among these groups amounts to little more than exercises in Derridiandifferance, Mai Mang, along with Zang Di and other students of the Chinese department at Beijing University who began publishing in the late 1980s, can be credited with having contributed finely wrought poetic works to the rapid and highly uneven development of Chinese-language poetry. It is this work, in fact, that later blossomed into the “intellectual” style, one of the major trends in Chinese poetry of recent years. Had Mai Mang stayed in China, he would undoubtedly have become a main feature of the contemporary poetry scene. Regardless of how the author discovers the bridges between English and Chinese, this “frame of mind” is one which indeed bears the weight of two languages, if only briefly and intermittently, throughout the collection. To fully appreciate this volume we also need to forget about that trans-lingual experience and move on. This requires a certain strategizing—working from the poet’s “Afterward,” wherein he discusses in some detail his development as a poet, backward through the collection, the reader can arrive at a kind of historical reading, one which charts the poet’s evolution. Mai Mang was born in the south and at an early age was drawn to the poetry and narrative of Qu Yuan, China’s prototypical figure of exile. He travels on through a personally and politically seminal transition in Beijing in the 1980s, graduate education Los Angeles in the 1990s, back through Beijing before finally arriving in Los Angeles once again in 1998. With this trajectory in mind, and aided by the actual form of the collection, which is laid out in chapters with headings such as “Beijing” and “Los Angeles,” the reader can plot poems according to an odyssey of aesthetic self discovery. As the collection progresses, a lingering quality—one which is attached to the “universal condition of exile” (p. 162)—merges to frame the poet’s experience. Given that these poems, collected, edited and translated from his current residence on the East coast of the United States, the exilic state of affairs builds itself in layers and continues, accruing and intensifying its ambivalence. For the poet and his poetry, the further he falls from his nest, the thinner he becomes, the greater the search for an identity, the more meaningful the discoveries are. What the reader finds in this volume is a chronicle and a document of trans-lingual and exilic experience as evidenced in one author’s struggle to find himself in a new language. It is not entirely successful in that new language, but it is never dull. The works are, for students of poetry and Chinese as well, rare and unflinching views into the translation process itself. This level of access is impossible in the more common scenario, where the poet merely hands his or her work off to a translator to render it into another language. While that process often generates better poetry in translation, the lines separating creator and translator are obscure at best. In this case, students are invited to participate in an on-going translation process (which, the author tells us in his “Acknowledgements,” “may call for future revisions,” p. 165). The opportunity to rework these poems and experience first hand the exciting but often cruel give and take of literary translation makes this a worthwhile volume for classroom and personal use.